Well they say that there is an app for just about everything, and now there is one for even the iPhone itself. The “iPhone in iPhone” augmented reality app is basically a promotional app developed by Ogmento – a company which is currently focused on developing mobile augmented reality games and apps. The said company is home to popular augmented reality apps like ‘Put a spell’ and ‘Pengun books’ etc. 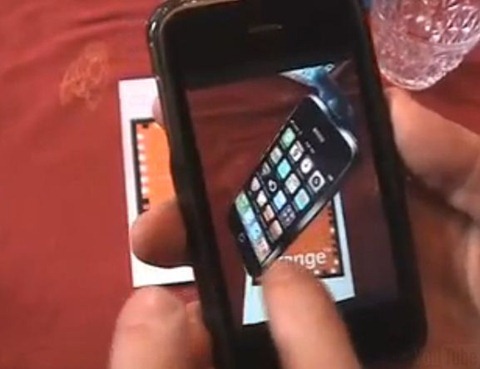 The ‘iPhone in iPhone’ app is developed to promote the launch of iPhone by Orange Telecom Israel. In the app, when you point your iPhone to the Orange logo, a virtual iPhone appears on the screen hovering over the logo. You can use your finger to turn the iPhone around, zoom it in or out, and even launch other applications within this virtual iPhone simulator simultaneously.